At the corner of Main and James sits a bite of The Big Apple. 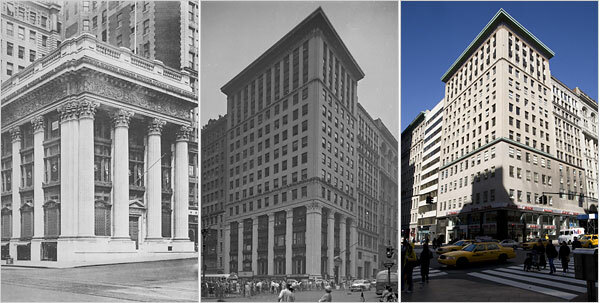 The Landed Banking and Loan Company Building, designed by Charles Mills, is a direct descendent of New York City’s Knickerbocker Trust and Safe Deposit Bank building. 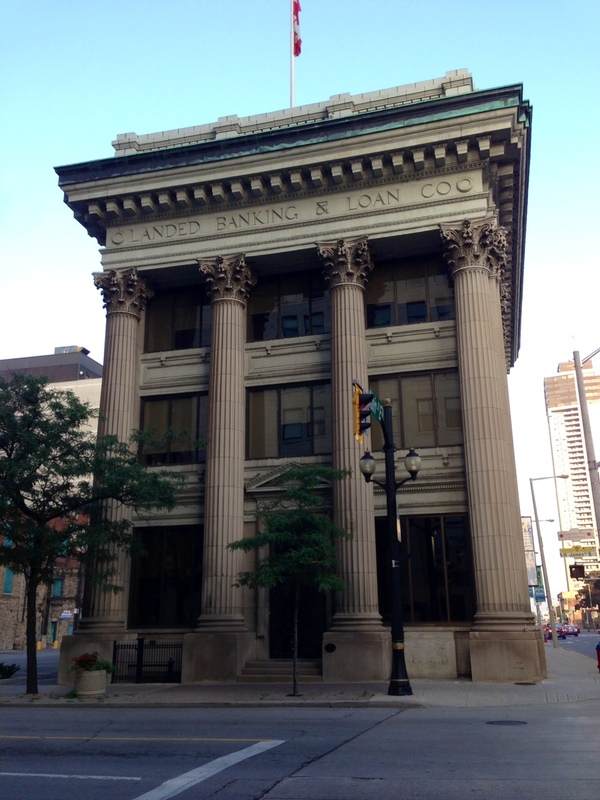 Finished in 1908, The Landed Banking and Loan Company building is the oldest remaining bank building in Hamilton. Although it’s inspired by another building, the old bank has it’s own unique features. Between the floors a wall panel makes the pilasters less prominent, but it’s presence is just as commanding. The exterior is composed of Indiana limestone and also consists of large-scale entablature, and a balustrade. Located at Fifth Ave and 34th street in New York City, the Knickerbocker Trust and Safe Deposit Bank building was designed in the Beaux-Art tradition by the firm of McKim, Mead and White. 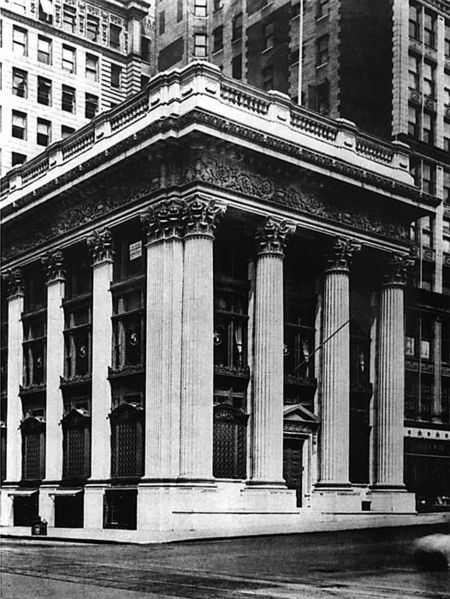 Completed in 1903, the three-storey Classic Revival bank consisted of a Vermont marble exterior, colossal Doric columns, pilasters, and traditional Corinthian orders. The transition between the facades demonstrated responsiveness to context, while the entablature and balustrade added a masterful touch. When first commissioned, the Knickerbocker Trust and Safe Deposit Bank building was meant to be 13 stories. However, the solution to super-impose an additional 9-storey element didn’t come to fruition until 1921 when ten stories were added. The building was redesigned in 1958 and is now unrecognizable. In 1986 the Landed Banking and Loan Company Building was granted heritage status. There have been minor repairs to the building, including the removal of a night safe deposit box on the west elevation. With the Canadian flag flying high, the building is one of the city’s most treasured pieces of built heritage. I can’t seem to find anything about the business that was in that building. In Toronto there are two buildings that were Sterling banks. One is now a 7-11 the other is a Pizza-Pizza. The business Sterling bank became part of what is now CIBC and that information was easy to find. Landed may have became insolvent but there is nothing on the net that supports this theory.